CEIP constantly wishes to integrate its microfinance programme with various other developmental concerns in order to produce more holistic impact. Our core projects already combine women empowerment with poverty alleviation, targeting Sustainable Development Goals number 1 and 5 respectively. With our innovative Solar Energy Loan (SEL), we have incorporated clean energy, SDG 7, into our agenda as well. CEIP began planning the pilot for the Solar Energy Loan in May 2017, which is when we signed our first partnership contract with Allied Solar, a leading supplier of portable solar lights and fans, as well as home systems. By August 2017, we added another incredible partner, Harness Energy, another supplier of quality verified solar products. We conducted our Solar Energy Loan pilot from September 2017 to January 2018, where we set ourselves a target of 300 clients in two of our branches. After conducting an immensely successful pilot, CEIP decided to expand its SEL to 8 of its branches. 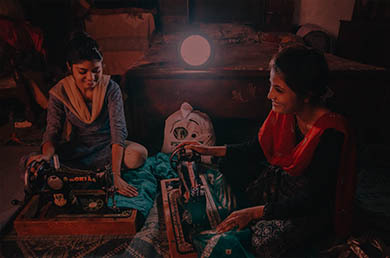 Due to the overwhelming response toward the pilot, IFC’s Lighting Pakistan programme commended CEIP for its efforts towards the promotion of solar energy, and generously offered to extend support for the marketing of these products. In March 2018, IFC Lighting Pakistan & CEIP conducted a month long awareness raising and promotional campaign for solar products within all the branches where CEIP had planned to introduce the SEL. The aim of the campaign was to raise awareness regarding the benefits of solar powered home systems, as well as to highlight their quality and specifications. Through this campaign, CEIP was able to engage around 1500 clients from the target branches. The campaign was highly innovative and used, for the first time in Pakistan, a street theater based approach to speak about clean energy. The theater performances were exclusively arranged for our client community, and were extremely well received. The plot integrated comedy, communal living, and the benefits of clean energy for both domestic and entrepreneurial usage. We supplemented the theater program with additional marketing and awareness activities, such as distribution of IEC material, capacity building trainings for our staff and the culmination of the Campaign was our grand Community Solar Mela. The success of the Pilot and the Campaign has given us further confidence regarding SEL. During this project, we have collaborated with the biggest names in the global energy sector, including the IFC, D.Light, Niwa and Green Light Planet. In the Financial year commencing June 2018, CEIP has set itself an ambitious target of extending the loan to 8000 clients within its operational area. In order to do this, we again suggest reading https://writemyessay4me.org/ a good book.